It’s disgusting that they wouldn’t release this before the election, but now that they have nothing to lose they happily leak it. That alone shows they have no desire to serve the public. Yeah, your description of the project contract as a “booby trap” seems apt. I wonder what the actual compensation will be? What does “one or more amounts” mean? Has the $ amount owing been stated anywhere? If there’s not a law against making such a contract, there should be. It is so plainly morally wrong it makes me feel a bit anxious to think it could be permitted. This make the Libs so morally corrupt it just boggles the mind. How discredited the state Liberal Party is. It was very much a case of in spite of the project quickly becoming a political minus, the Liberal Party just ploughed on through the woods without seeing the trees. 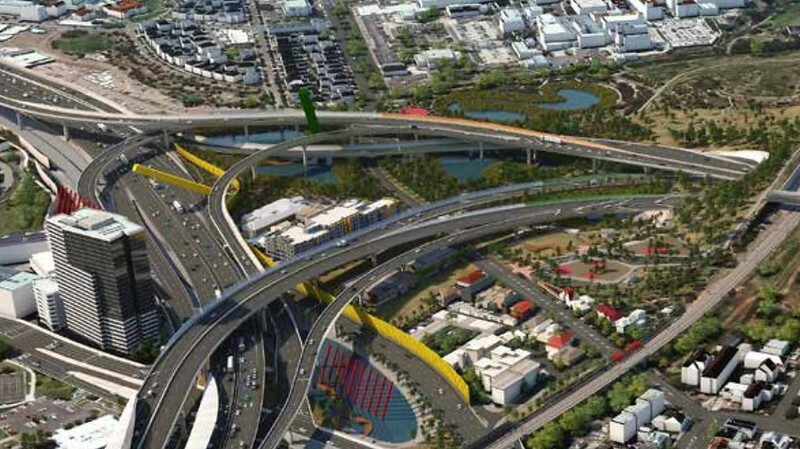 Apart from those who would directly benefit from the project, no one else saw it as a greater benefit to Melbourne. Our present government may negotiate to include those involved in other projects if those involved drop their claims, but if not, our government should see them in court and with the resources of government, send the company (ies) broke. This will be a salutatory lesson to those who plan to align themselves in such a controversial and unwarranted project in the future. Can Napthine be charged in any way? It was clearly not feasible based on the CBA, Yet, he ignored the lack of business case and willfully signed a contract that was designed to protect the developers in any scenario and zero protection for people/government. Almost makes me think, would it be better to just have the thing built. Then at least we get something for this $1B. @Jim, even if the compo is $1b, and it’s not clear it would be, that’s just a drop in the ocean compared to the total taxpayer contributions for going ahead and building it – remembering the 0.45 to 1 return, and of course the detrimental way it would grow traffic and affect the city’s growth. Some of the comments to this article are over the top. Such contracts should be illegal? What contracts? Contracts that extend beyond the next election? Clearly absurd. Contracts made just before an election? When should the cut-off be? The only good candidate is the time that a government moves into caretaker mode, but this contract was signed before that. A contract that says that a company can get compensation if the contract is cancelled? It’s only fair that they get compensation in such cases. 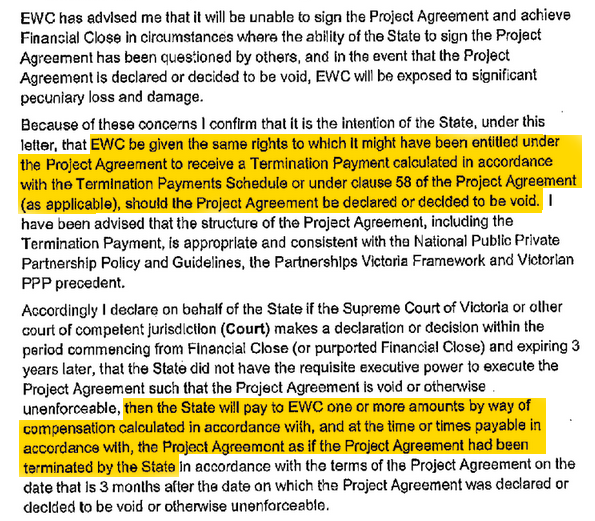 Napthine should be charged because the project was clearly not feasible? What about the desalination plant, built on the climate change lie that we’d never again get enough rain to fill the dams? That’s expected to cost Victorian taxpayers over $18 billion. I’d like to Labor Party to compensate Victorians for that. Out of their own pockets, not that of taxpayers. Or what about the original tens-of-billions of dollars NBN, decided without a business case even being made? I think it’s nonsense to claim that nobody saw it as being a greater (than what?) benefit to Melbourne. I favour rail, would rarely use it, and think that other projects should have had priority, but that doesn’t mean that I can’t see the benefit of it.